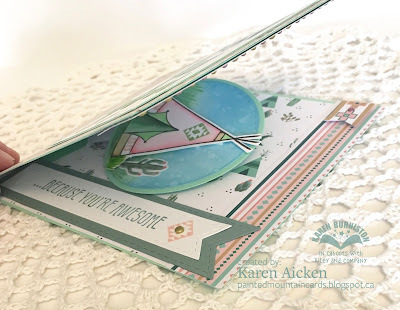 It's Masculine Card Monday here on my blog and I have a Gatefold card to share today using older paper from my stash. I really like these cactus/succulent dies so used them again here. The pot was wrapped with some twine for dimension. Here is a look at the card when it is open. This card went into the box to donate to Seniors Secret Service. If you follow my blog, you know that our young Granddaughter Olivia suffers from Pulmonary Hypertension. This is a rare, degenerative disease with no cure. There is a lot of care required, and many visits to the Children's Hospital both here in Calgary and in Edmonton. So I like to send my daughter Love Notes every ones in awhile. This card was made for her. 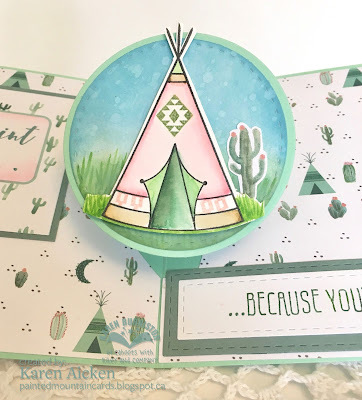 I used Karen Burniston's Snowman Twist Circle Pop-Up - that die is so much fun. People who receive one of these cards open and close it several times to watch the centre circle twist and pop-up as the card is opened. 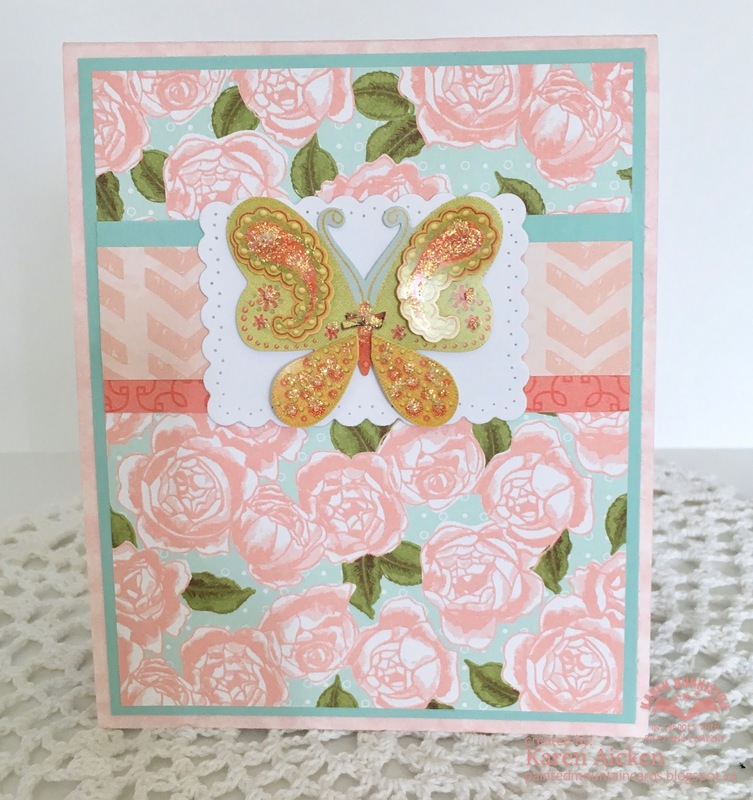 For this one I used some new patterned paper and an older stamp set from my collection. Yesterday's card was also made with the Snowman Twist Circle but it looks completely different. These Pop-Up dies can be used for so many different occasions, and when you get to choose the card size, that even adds to the versatility. The printed piece below was also in the paper stack, I simply fussy cut it and adhere it to the left side of the card. 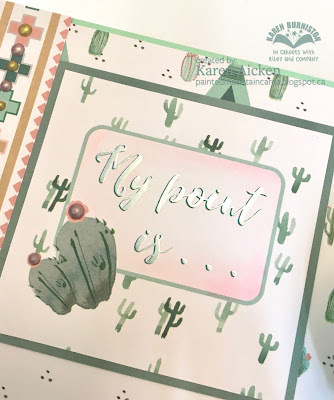 I liked that saying with the cactus, and that it is pearl embossed as well. On a side note, I have been puttering away in my Craft Room doing some re-organizing. My room is much smaller than the one in our old house, so I had to store some of my supplies (stamps!) out in the garage where I could get to them. Olivia's diagnosis came on our moving day so as you can imagine we were not thinking very clearly while directing the movers. I now have a chair lift so I can get to the basement and while poking around down there earlier this month I came across a whole shelf of my stamps! I didn't know I had stamps stored down there so I was pretty excited. Included were all of my South West themed stamps and my ground/grass images. Woot! I have now peeled all the SW ones off of their wood mounts (sniff), adhered them to clear DVD cases AND indexed them all. I just worked a little at a time and got it done. They are now stored right in my craft room and I'm excited to get reacquainted with them. Next up will be to do the ground/grass ones. It's Saturday so that means a new challenge at the Crazy 4 Challenges Blog. Our July 2017 Hostess is Maryann Einam with Kristine Reynolds joining us as our Guest Designer all month. You can see Kristine's blog HERE. Here is Maryann's challenge: According to the Days of the year calendar, today is International Tiger Day. 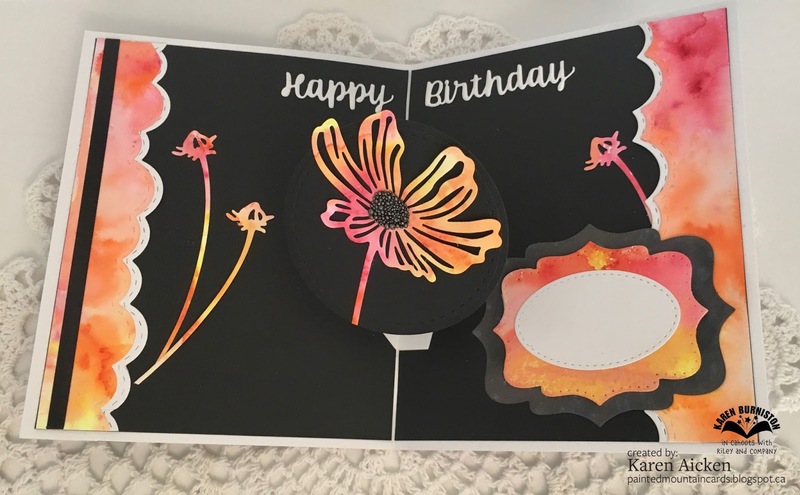 Create a card using the colours Orange, black and white for your theme. The Ellen Hutson Blog says that Black and White is very trendy right now, especially with pops of orange. 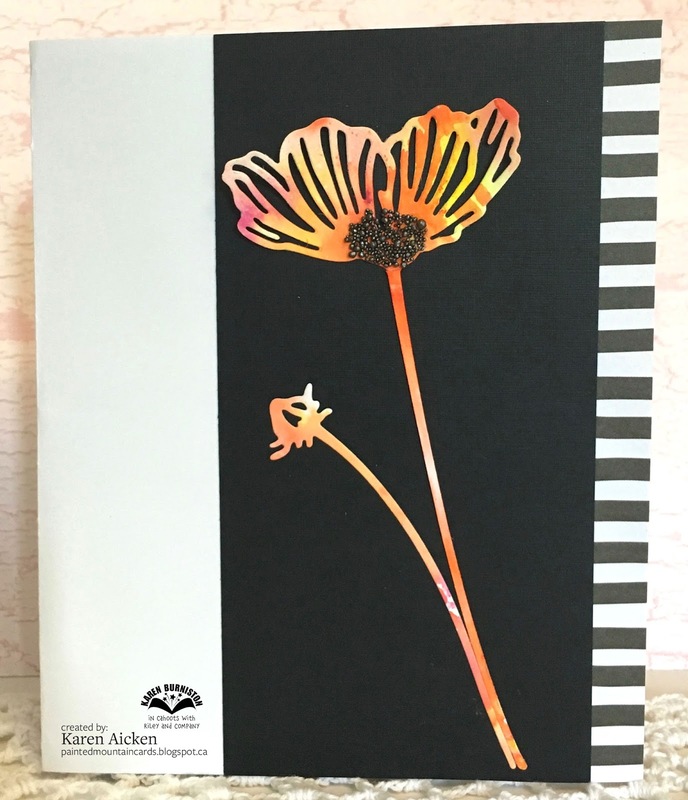 In fact, one of the cards on that blog post inspired me to dig out this black and white striped paper as an accent for my card today! I love these Poppy dies - they are just SO striking. Here I die cut them from a piece of my own water coloured background paper that was created with Color Bursts and Magical Shakers. I added some black prills to the largest poppies. The colour theme continues inside. 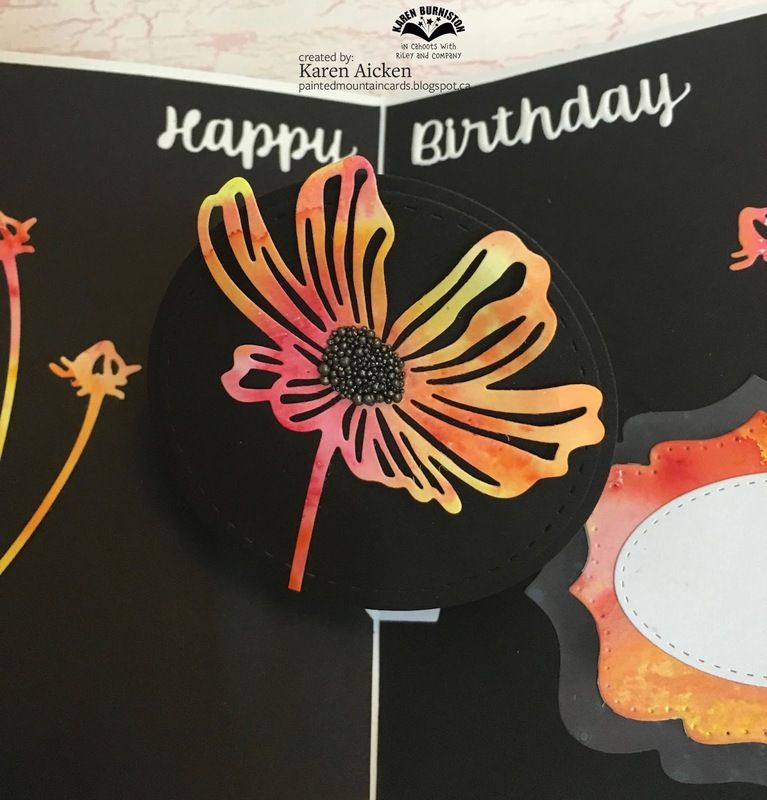 While it's hard to see in this photo because black is hard to photograph, the centre poppy twists then pops up as the card is opened. I used a bunch of Karen Burniston's new dies for this card - the animation comes from the Snowman Twist Circle Pop-Up. Sometimes I cut the centre fold line of the inner card, which allows the whole card to open wider. Because both the inner and outer card stocks were relatively heavy, this technique worked well for this card. I really like that there is a stitching line on either side of the cut line on these 'puffy clouds' from Karen Burniston's Nature Edges because you can use both the positive and negative pieces. I've done that here on either side of the card. If you want to see the one that inspired my card front, you can see the blog post HERE. Check out the C4C blog to see how the Crazies have been inspired by the challenge. We'd love to see your take on it, so be sure to stop by the Crazy 4 Challenges blog and link up your creations. If you are uploading to an online gallery, please use the keyword C4C396. Card size - 5 x 6"
It's Flip-It Friday here on my blog, and I have a holiday card to share today using the 5 x 7" Circle Flip-Its from Sizzix. 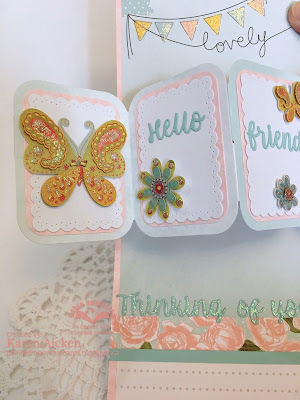 The size of the card base allowed me to use this larger glittered embellishment I've had in my stash for a number of years. 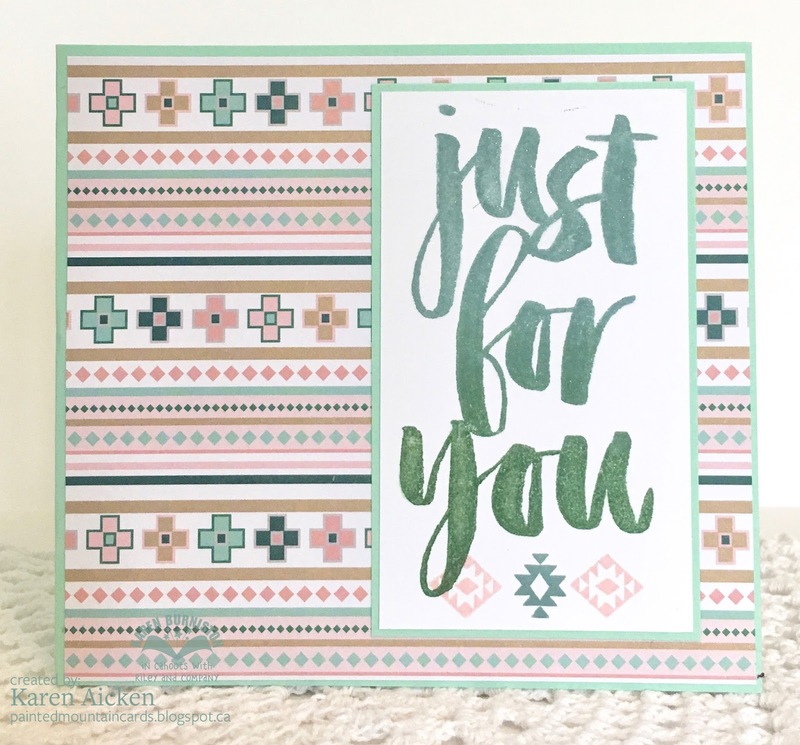 I also used the Stampin' Up holiday paper pack I purchased from their Clearance Rack. My plan is to use it up completely before the holidays this year. Into the holiday card stash it goes. Today I'd like to share two Birthday cards I made to donate to Seniors Secret Service. 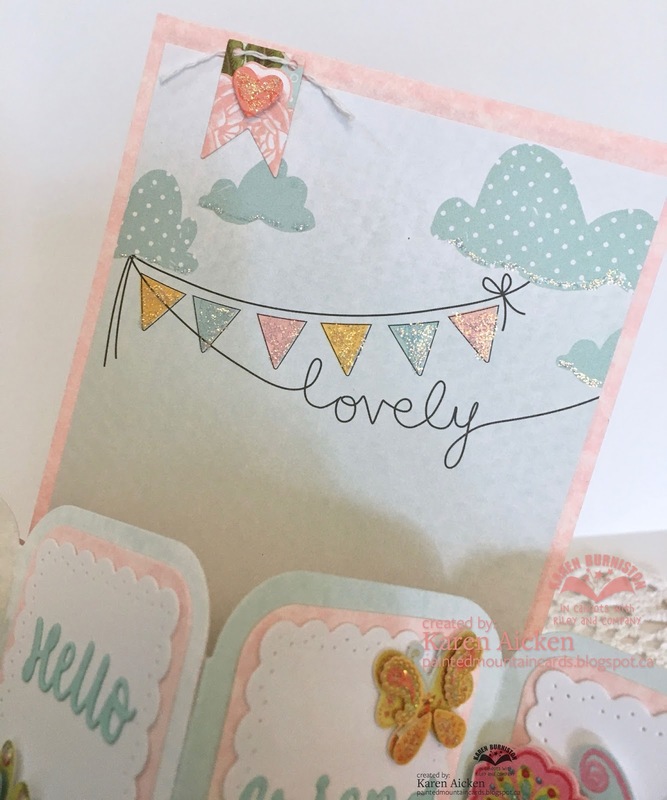 Both cards have a similar layout, with just the embellishments slightly different. This is what the card looks like when it's closed and ready to go into the envelope. The fox was stamped and fussy cut, as was the hat. I added a black glaze pen to the fox's eyes & nose, and some glitter to the party hat. Here is the card open. I added a different stamped hat on each of the centre steps. The circle that the fox is on, is mounted to the card front with an Action Wobble. I'm thinking the senior's might like watching it bob around. Below is the second card. 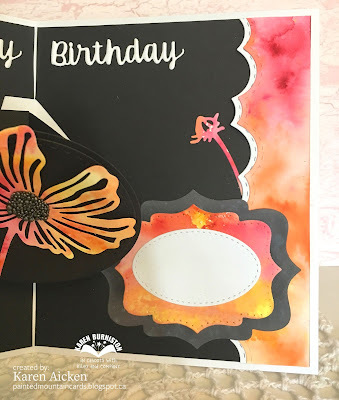 Amazing how swapping out the patterned paper completely changes the look! This time I added some hand lettering, doodles as well as a punched banner on the front edge of each step. This circle is also mounted to the card front with an Action Wobble. My card making process almost always starts with patterned paper, and from there I decide what stamps and or embellishments to use. 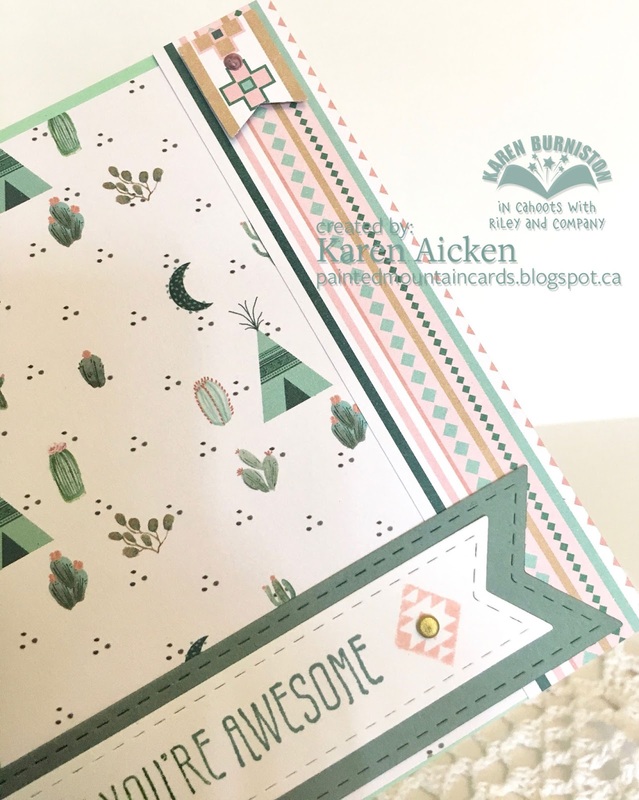 For this card, I had a 5 x 12" piece of patterned paper leftover from a different project and I liked the banners & clouds on the top area. So I knew I wanted to make a Pop-Up card with it. I also tend to finish the inside of my card first, then do the card front. This pretty patterned paper matched the card colours perfectly and I had a leftover butterfly sticker on the sheet. Done! 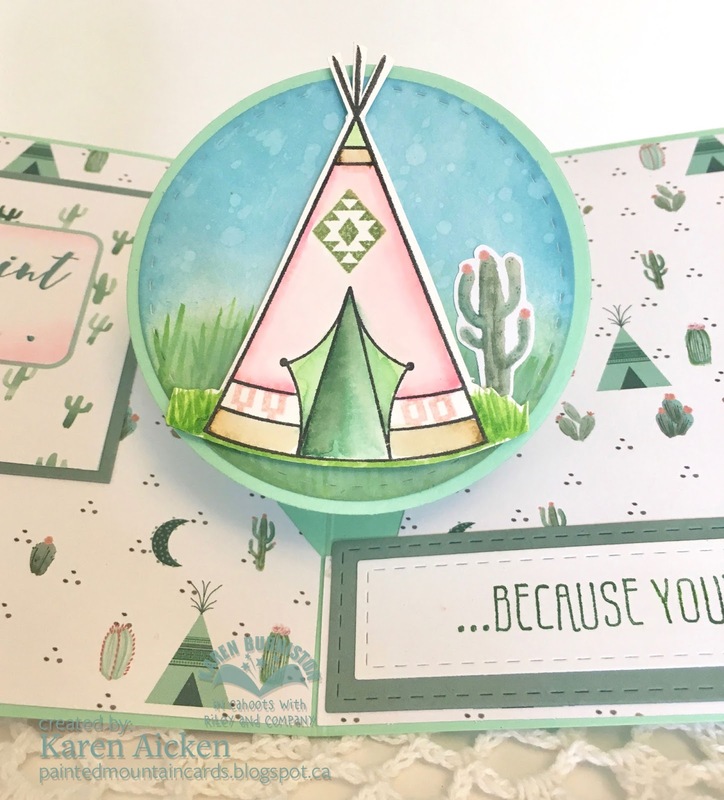 I chose Karen Burniston's new Twist Panel Pop-Up die set - it's very popular and you can see why. So much OOOOOH when the card is opened and all four panels spread and pop-up. Below you can see the pretty patterned paper that inspired this card. I added some 'Wink of Stella glimmer to the banners themselves, and also die cut one using one of the little banner dies in the Twist Panel Pop-Up set. 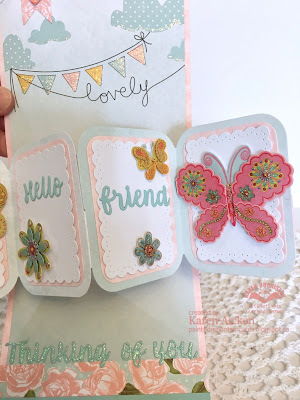 The white scalloped rectangle is SO sweet - I just love it. 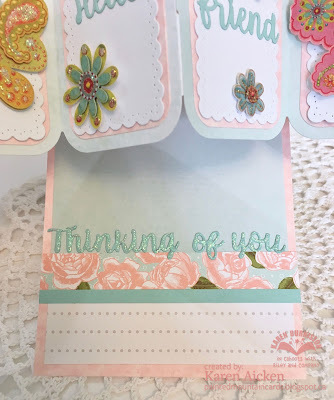 I added some sparkle to the Thinking of You below the Pop-Up panels to emphasize the point. 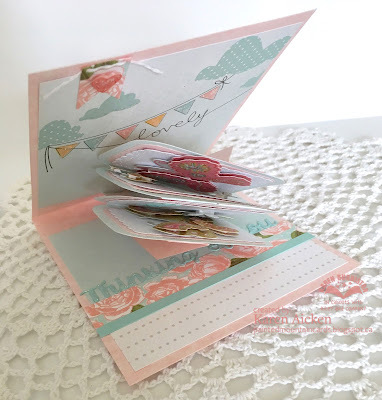 I love using up older products from my stash and this card helped with that - I finished off a sheet of 3-d stickers, used that leftover piece of patterned paper and also managed to use up the whole 6 x 6" sheet of roses paper so there are no scraps to think about storing. 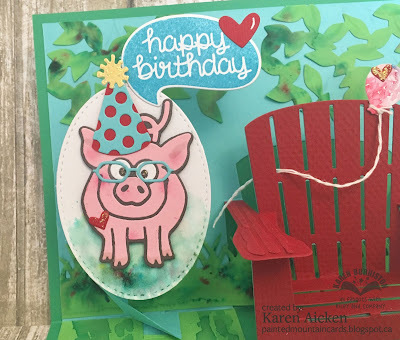 And I have a sweet Pop-Up card for a friend! 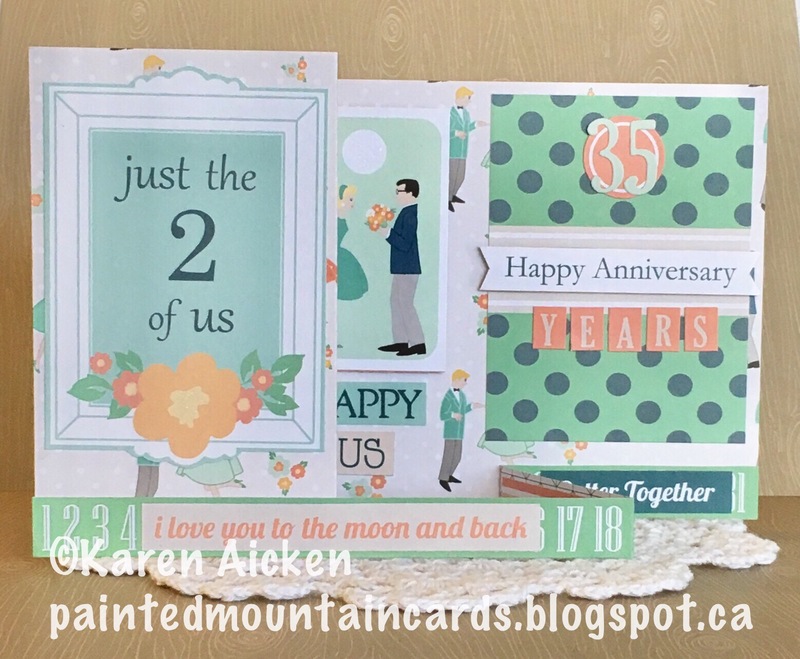 Card size - 4-1/2 x 5-1/2"
Today's card share is the Anniversary card I made for hubby. We celebrated our 35th Anniversary this year!! Because I can't really travel with this RA a trip was out of the question so we decided to splurge on some comfy new patio furniture. It makes our back deck a place to 'Stay-cation' and we are enjoying sitting out in the evenings with the fire from the fire table. Many paper stacks have a sheet or two of coordinating journal cards, and I decided to use the ones from this stack as decorative panels. There was a sheet of stickers in the stack which also got used on the card. Below is the back of the card, where I wrote him a message. He's the BEST!! And he quite liked the card - seems he is also a fan of the Double Z-Fold card. Card size - 6 x 5"
It's Masculine Card Monday here on my blog, and I have a Monster themed 'in a box' card that I made for our Grandson Ethan. I used Sandi MacIver's video (click HERE) for the box itself, and added these adorable stamped & die cut monsters. The Lawn Fawn word bubbles are proving to come in handy and I'm getting lots of use out of them. ... and the photo below shows that the card folds down completely flat. It would normally fit in an A2 envelope, but because I went outside the box perimeter with the word balloon I'll likely make one with my Envelope Punch Board. Otherwise a 4-1/2 x 6" envelope works perfectly. Ethan is going to love this card! I've been working on Christmas cards throughout the year, so today I have another one to share. 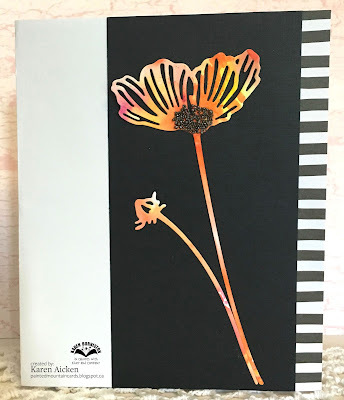 I have a new paper stack from Stampin' Up that I vow to USE UP on my cards this year. The card front has a scalloped bottom and one of those Swirly Scribble dies made into a wreath. Inside, I used an older Karen Burniston Pop 'n Cut die that cuts the NOEL right into the card for you. There is a coordinating Sizzlit die that cuts the word NOEL which leaves a nice shadow from the original base cut. Into my holiday card stash with this one. Card size - 4-1/2 x 6"
Here is Maryann's challenge: Today is Hammock Day on the Days of the year calendar, what a wonderful way to relax.....create a card with the theme of relaxation in mind. I wanted to make a Birthday card for our eldest daughter, and have to admit this card took a long time. But it was raining outside and I wasn't feeling all that great. So a whole morning spent in my craft room was warranted. As usual, I didn't have a set plan for the card - I just start with something and keep building until I'm happy with it. Apparently I just felt like doing a lot of building with this one! 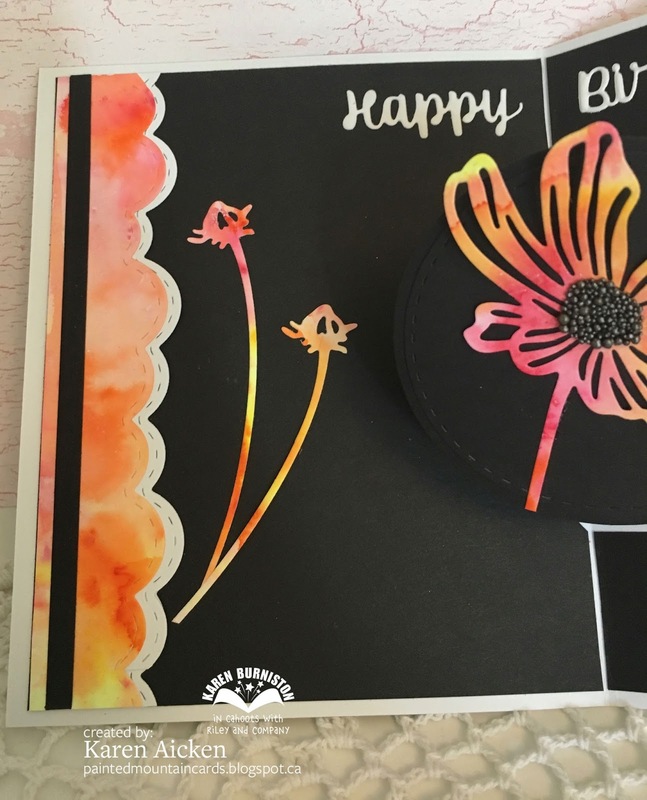 Of course I also wanted to play with some of my new goodies - namely the new dies by Karen Burniston and my Color Burst/Magical Shakers. 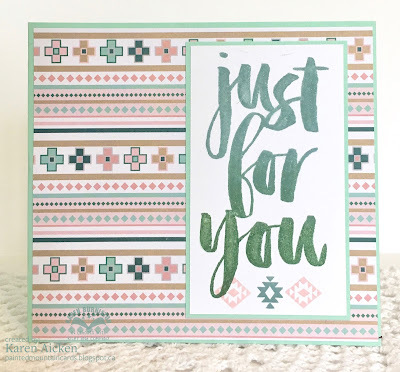 In fact, the whole card started by sprinkling the powders on regular green card stock and spritzing with water just to see if it would blend enough to give me something I liked. Which it did! 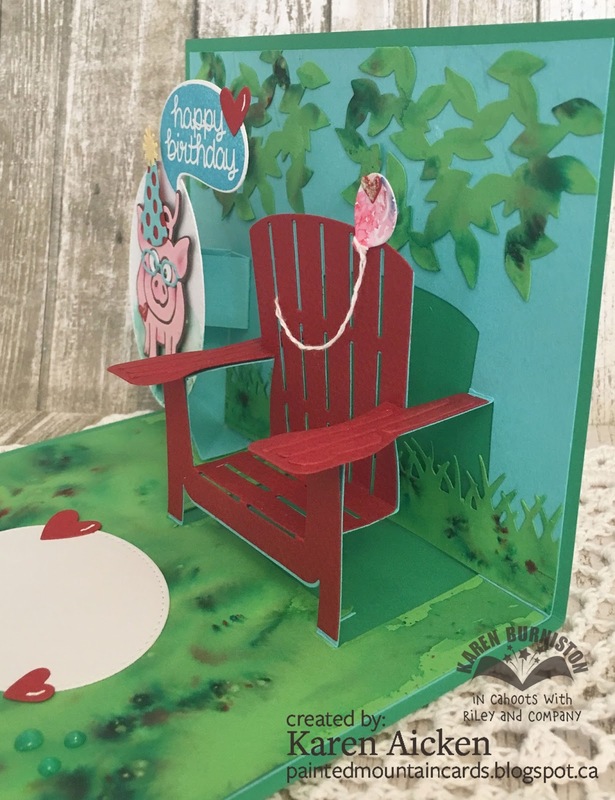 I used the largest piece inside the card, but also made sure there was enough to cut the tree foliage from the new Tree Pop-Up set. Having had good success with the green card stock, I tried a little of the water colour powders on a white card stock panel for the front of the card but wasn't as happy with the result. 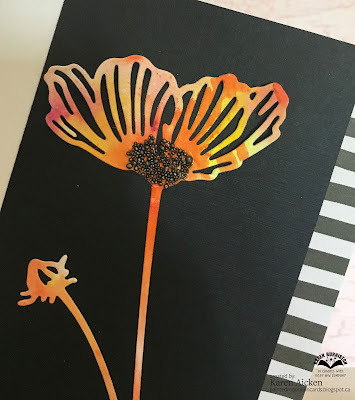 However, I used a grass stencil** and some dye ink in places and was much happier with it so continued on with the rest of the card front. 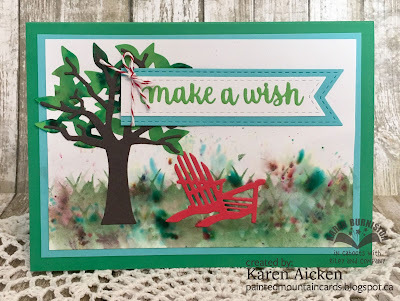 **Grass stencil was cut with an older Karen Burniston Outdoor Edges grass die from a scrap of card stock. It works great to drag colour over to create an inked grass border or clumps. 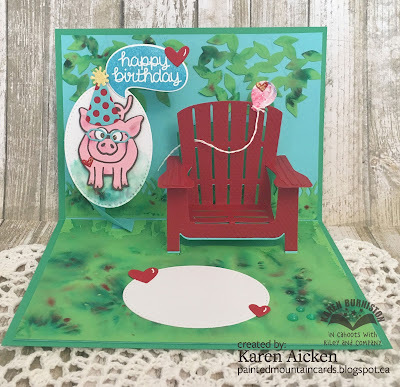 When I think of a relaxation card, I also think of Karen Burniston's older Adirondack Chair Pop-Up so used that inside. I had wanted to try using the pop-up arm mechanism from the new Katherine Label in a different way so placed that to the left of the chair. Then I added Virgil the pig wearing glasses and a party hat onto the pop-up arm - my daughter likes pigs! Really, Virgil is pretty cute even without the party accessories. 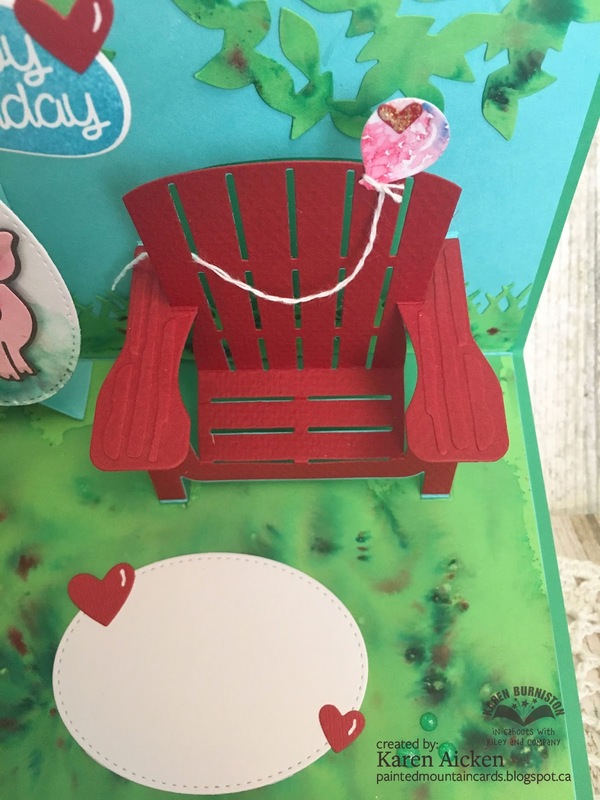 I was able to add a die cut Happy Birthday word balloon and added a die cut heart to that. There is a lot going on in this card! I added some more of the water coloured foliage to the top back of the card. and a balloon from the Birthday Charm set onto the chair. I added the included tiny heart over the charm hole on the balloon then wound 2 ply of Bakers Twine around the balloon stem and through a chair slat. 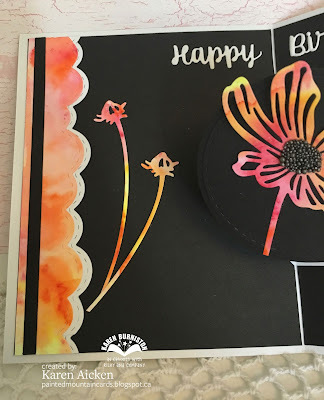 The fun thing about Color Burst/Magical Shaker water colour powder, is that you never know what you are going to get and it's impossible to duplicate something. Every piece is new and original, and my results are always unpredictable - which I love about them. Check out the C4C blog to see how the Crazies have been inspired by the challenge. We'd love to see your take on it, so be sure to stop by the Crazy 4 Challenges blog and link up your creations. If you are uploading to an online gallery, please use the keyword C4C395. Card size - 7 x 5"